Palermo Soho is the most bohemian section of the Palermo neighborhood. 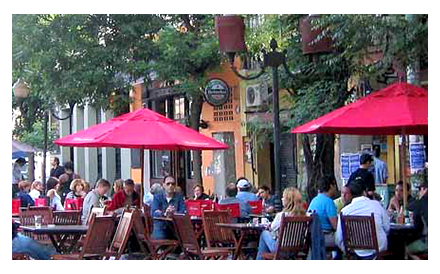 Located around Plaza Cortázar, the neighborhood is similar to New York's Soho because of its independent design scene and its cuisine. If you like fashion, design and cuisine, Palermo Soho is the perfect neighborhood for you to rent a room in. It has low-rise buildings and renovated houses with a vanguard design. At night you'll find bars and restaurants with all different kinds of food, from Argentine barbecue to vegan, Mexican tacos, Italian pasta, and sushi. Around Placita Serrano you're sure to see some street performances and vendors displaying their crafts for sale on a mat. You can also find in the neighborhood different painting and plastic arts studios. Many very well-known brands have stores in Palermo Soho where they show their fashionable designs and decorations. Comfortable and very spacious doble room with private bathroom for rent in a house in Palermo Soho. Comfortable and very spacious single room with private bathroom for rent in a house in Palermo Soho. So nice apartment in Palermo Soho! A single bed room with private bathroom to rent in Palermo Soho neighbourhood. The nice decoration and a good localization are the type of advantages that will make you love this house in the middle of Palermo.